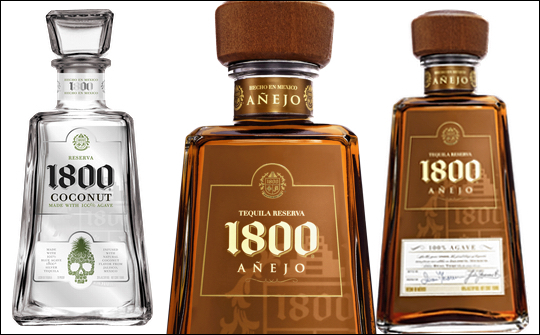 Proximo Spirits is introducing new bottle closures for 1800 Tequila in May 2015. There will be new metalized caps on the Silver, Coconut and Reposado bottles, and a dark wood cap topping the Añejo bottle, which will deliver a sleeker, more modern look for the brand. Pictured above is the currant and new look for the Silver, Coconut and Reposado bottles. There are no other changes being made to the bottle or to the tequila at this time. 1800 Tequila will still maintain the iconic trapezoid shape and the same quality liquid. 1800 Tequila is claimed to be the United States’ best-selling premium tequila, renowned for being expertly aged and consistently smooth. Named after the year it was created, 1800 Tequila is made from 100% blue agave grown on family-owned ranches and bottled in Jalisco, Mexico. Each bottle of 1800 Tequila is double distilled for superior drinkability. The complete 1800 portfolio includes: 1800 Silver; 1800 Reposado; 1800 Añejo, which has just been awarded World's Best Tequila 2015 in the World Drinks Awards (taste category); 1800 Coconut, which won the Best Tequila Design Award in the World Drinks Awards (design category); 1800 Milenio, 1800 The Ultimate Margarita; and Essential 1800 Artists Series. 1800 Tequila has also announced the next stage of its groundbreaking Enough Said campaign. Created by The VIA Agency and entitled Enough Said Episodes, the video series will feature Ray Liotta and Michael K Williams reminiscing on personal stories of struggle, toughness and triumph. Through separate narratives, each man expands on the values inherent to the 1800 drinker – namely, what it means to be effortlessly masculine, unique and impossibly cool. In the first edition of the video series, 1800 follows brand spokesman and esteemed wiseguy Ray Liotta on a journey through New York City as he discusses his ceaseless pursuit of quality, as both an actor and an 1800 drinker, sharing teeth-cutting anecdotes of his rise in the industry. Following Ray is Michael K Williams, famous for his tough, antiheroic Omar on the critically acclaimed HBO series The Wire. In his video, Williams reflects and riffs on the ice-cool machismo he learned growing up in Flatbush, Brooklyn. The first video featuring Ray Liotta is now on YouTube.com/1800TequilaOfficial, it will be followed by the Michael K Williams video on 15 April. Proximo Spirits in Jersey City, the producer, distributor, importer and marketer of spirits in the US, represents many premium brands including: Jose Cuervo Tequila, Three Olives Vodka, 1800 Tequila, The Kraken Black Spiced Rum, Maestro Dobel Tequila, Gran Centenario Tequila, Ron Matusalem Rum, Boodles British Gin, El Zarco Tequila, Hangar 1 Vodka, Stranahan’s Colorado Whiskey, TINCUP American Whiskey and Bushmills Irish Whiskey.